Every child loves Christmas, it’s when they can ask Santa for what they’ve been wanting all year and waiting for him to leave it under the Christmas tree. Mom took her little girl out to the mall, when he little girl began tugging on her shirt, asking if she could ‘talk to Santa’. Mom looked around confused, then noticed that her daughter was referring to an elderly man, donned in red jumper with a white beard. Mom smiled and said that Santa is very busy but she could try. 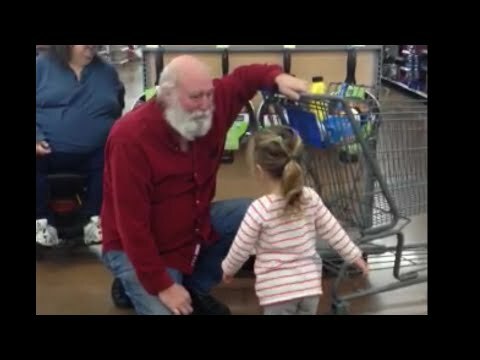 Her daughter approached ‘Santa’ and began talking to him, and he knew exactly what was going on and played along. The whole interaction left everyone smiling!